A few months ago, I had the fun opportunity to help fellow Texan and friend Dana Tanamachi with her studio. Dana is an unbelievable designer who basically pioneered the chalk + typography movement. Her designs are all over the place from Time and O Magazine to West Elm and Burton. This girl has got it going on! All images taken from Dana's website. Dana lives a few Brooklyn neighborhoods away from us and had been sharing a large studio space in her apartment with a friend. Dana's business had grown so much that it made sense for her to take over the whole studio. The studio mate moved out and I got to step in! I'm not sure you can tell by my terrible iphone picture below, but Dana has vintage posters, photos, keepsakes, design books and artwork sprinkled all over her studio. It was important to her to have beautiful and interesting inspiration throughout the space. Here's an idea of Dana's studio before, but PLEASE keep in mind, this picture was taken in the throws of transition in her studio! - make a fun bar area! Here's what we came up with! We brought in 4 long aluminum shelves from CB2 to fit all of her fab inspiration and keepsakes. She had already purchased those 2 Eames chairs, so hello, we totally used those. CB2 had the best little filing cabinets in this minty robins egg blue that fit perfectly under our (find of the year) vintage desk! I don't know if you can really tell from the picture, but the desk was probably 12 feet long. Thank goodness Dana lives in a building with massive stairwells, or that desk would have met it's fate as street merch. The rug is from Sundance, a place Dana passed along to me. It's mostly clothing, but they have an AMAZING rug category online where we found this baby! I'll post more information on the rug in a separate post. Secret: Every year Ralph Lauren holds a mega sale where they liquidate tons of their furniture and propping from stores and show rooms. It's open to RL employees first then to the public. Brooklyn Boy was working at RL at the time so I picked up lots of fun things for clients . . . and ourselves! I could look at all of these little things for hours. Terrariums and small compact plants are a great way to bring a little life into New York apartments. Had to show off these paperweights Dana did with West Elm. On the other side of the room, we found a rustic console table that used to live under a bulky hutch top. We removed the top piece, updated the hardware with these Anthropologie pulls and set up her printing station below. Dana had such awesome stuff, so we tried to find intentional little spots for each thing. Like these mini books above with their fantastic patterned covers! Oh....this chair. Man do I love this vintage oversized pinstripe chair! This was another Ralph Lauren Annual sale find! Floor lamp is Anthropologie. The bar area had a spot from the start, snug in between these two large windows. We went mid century for this piece which I loved. The piece is actually a functioning bar with a shelf tha swelves out when you open it up! Crazy-weird-cool. The whole room is such a mix of woods and styles - Makes everything feel collected and interesting rather then a humdrum full set. Vase from Anthropologie. Glasses from Fishes Eddy and the tray from CB2 (I think!). Every Texan in the city needs a cactus. Here's a more present day photo of the bar area, taken by friend and wonderfully talented photographer, Eric Ryan Anderson. How amazing is that Burton snowboard Dana did! Fits perfectly above the bar! 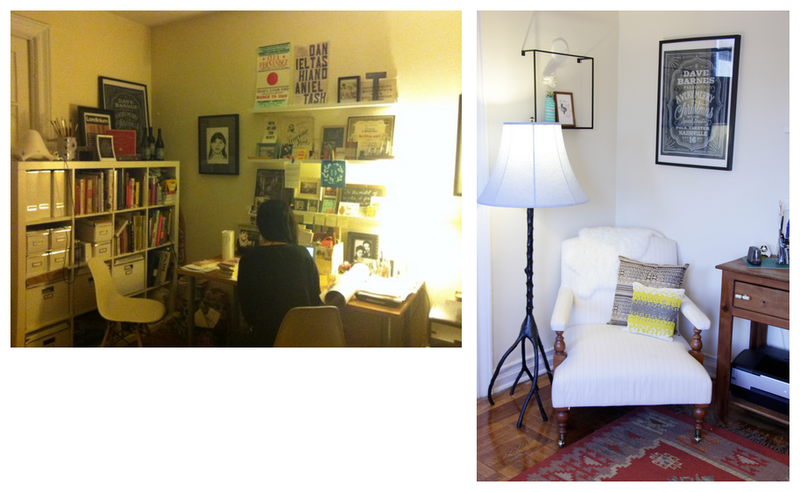 Lets compare a few before and afters to give you some perspective of how the room changed. We totally rearranged the layout by moving the desk to the main back wall, making a very striking first look into the room! Before we started, Dana moved a lot of office materials and files into a closet in another room. Sometimes a little editing can make the biggest change! Hope you enjoyed the reveal! It was one of my favorite projects to date.